By franklparker in Author Resources on April 15, 2019 . I have gone to finding hungry English grad students to wade through m y work looking for clams. 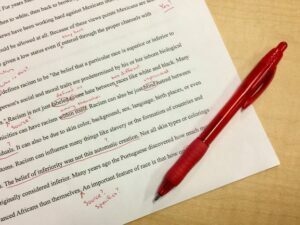 Unclosed quotes, spacing, spelling that didn;t get picked up by the red squiggle. However what I have found to be quite prominent in “editors” is the ultimate desire to turn our work into the Same Ol Stuff. While on the one hand they say “love this” and on the other ask you to remove or reorient what made them love it. Strange. More internal monolog, they talk too much, they don;t talk enough, why is so and so so dismissive. Oh, I should read the whole thing before I get out the red pen? Finding a pro is a tough job. And none to inexpensive. And it’s true, you need someone you can work with who sees your work, and whacks the fluff. But based on what I’ve read as published lately, I am reminded of Dire Straits’ MOney For Nothing because a good many “editors” don’t appear to be working very hard these days. The “dos” and “don’ts” in much published advice are certainly confusing, Phil. The important thing is that it is YOUR work and anything the editor suggests that you feel detracts from your intention has to be ignored. And if there is much like that it’s time to say “thanks, but no, thanks”.